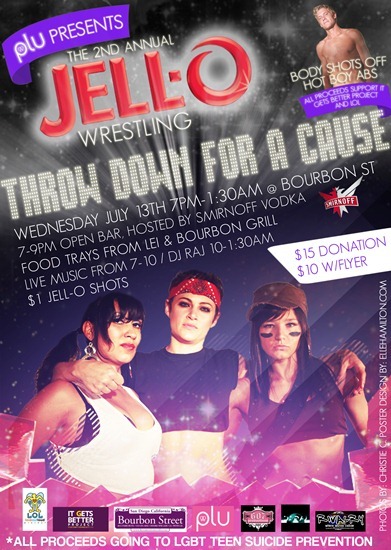 The Pink Fury will hit the Jell-o pool in a pink Hello Kitty lucha libre mask and a silver one-piece bathing suit tonight for the second annual Jell-o wrestling event at Bourbon Street Bar & Grill in University Heights. If girls in gelatin ain’t your thing, male models will be available for body shots. There will be an open bar from 7 to 9 hosted by Smirnoff Vodka with food trays from Bourbon Street and Lei Lounge, and $1 dollar jello shots all night long. Entertainment includes a live band from 7 to 10 and DJ RAJ from 10 to 1:30. Tickets are $10 in advance or with flyer and $15 at the door.